It’s been requested I feature more Aussie polishes on my blog so I have for you today a floral manicure using a pretty pink polish from great Aussie brand Ulta 3. I actually have quite a few Aussie polishes and they are fantastic so I have no idea why I don’t use them more! I will try to use them more often so international ladies can see what we have on offer Down Under. I used Ulta 3 Pink Supreme which is a frosty light pink polish with pink and gold shimmer through it. It's soooooo pretty!! It’s very work appropriate and is lovely and shimmery. It applied a little thick but it wasn't difficult to work with - it's probably best to do 3 coats for full coverage. Below is 2 coats with some VNL but I was planning to konad on top so I left it. Don't take any notice of the bald patch on my pinky! 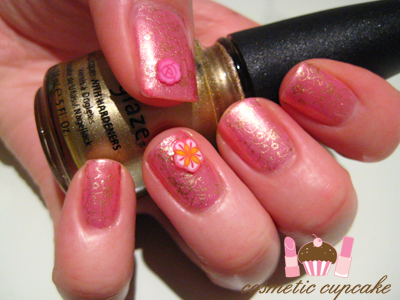 I then kondaded floral full nail design from Konad plate m73 using China Glaze Passion. I then added a fimo clay flower on accent fingers and thumbs and topped it all off with a coat of Poshe topcoat. I hauled Poshe topcoat recently in my first order from Transdesign! You can win your own bottle of Ulta 3 Pink Supreme in my Polished Pink for October giveaway here! This looks really nice, it's subtle n yet quite elegant in the pattern! I also have linked this entry into my facebook page too! this is so cute! the fimos really brightens it up. Hey this color looks sooo pretty!!! Love it...Great blog honey. Try checking out mine. @Msodapop: Glad you like it! I'm flattered you like my pictures considering my camera is a few years old and is just a point and shoot =) I use a Canon Ixus 70. I love Canon cameras! @Nikki: Thanks Nikki! Stamping and fimo just go so well together hehe. @Christina: It's a wonderful pink polish! I don't have any other like it so I'm happy it's in my collection =) So glad you like it! 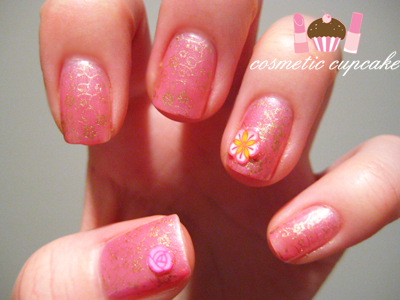 @Ronnie: Thank you for your sweet comment Ronnie =) I was aiming for an elegant mani! @AnnKiins: Ulta 3 is a great Aussie brand so you've probably seen it on Aussie blogs. They have some great polishes for a cheap price! @Minolah: I'm so happy you like it! Thanks for stopping by and commenting! love the pink supreme, reminds me on my candyfloss haha! the gold konad is great, have you thought about a violet konad? I'm not sure but I kind of see it fit on the polish. @Donna: I totally agree that the Ulta 3 pinks aren't very exciting but Pink Supreme caught my eye with the gold shimmer. I'm glad I got it! It's perfect for days when you have to be a bit be more conservative. I actually picked up a bright pink called "party shoes" from their new range and it looks very promising. Great for summer! Yay for Ulta 3 bin swimming! Especially on Thursday night =) Hope you find it!